Wannacry is infecting more and more computers. This is a real dissaster for those people that cannot get their files back. What is ransomware? It’s a malware (a Trojan or another type of virus) that locks your device or encrypts your files, and then tells you that you have to pay ransom to get your data back. It’s not cheap, and there’s no guarantee of success. If you become a victim of ransomware, try those free decryption tools and get your digital life back. This section will provide a brief tutorial on how to remove WannaCry/Wana Decryptor using MalwareBytes and Emsisoft. While both can remove this infection on their own, as new variants are released it is better to have double-coverage during the scan. 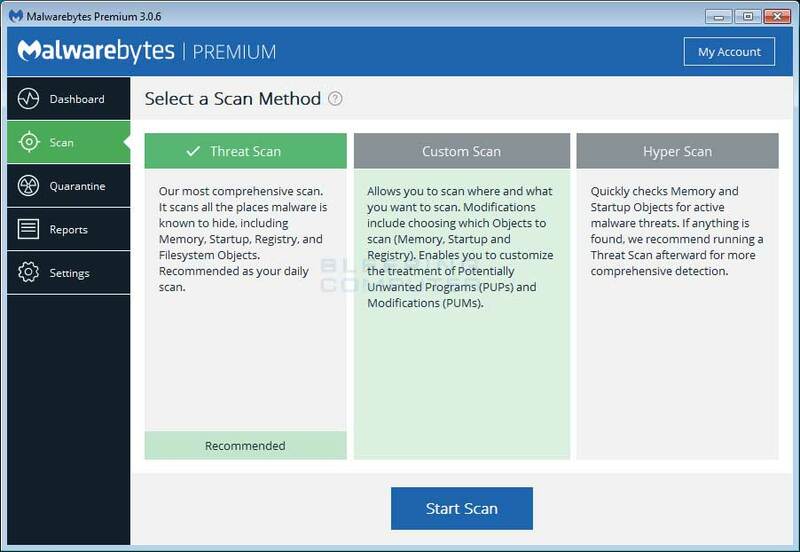 Furthermore both of these tools are free to scan and clean and you only need to purchase them if you want real-time protection or behavioral detection from ransomware. This removal guide may appear overwhelming due to the amount of the steps and numerous programs that will be used. It was only written this way to provide clear, detailed, and easy to understand instructions that anyone can use to remove this infection for free. Before using this guide, we suggest that you read it once and download all necessary tools to your desktop. After doing so, please print this page as you may need to close your browser window or reboot your computer. 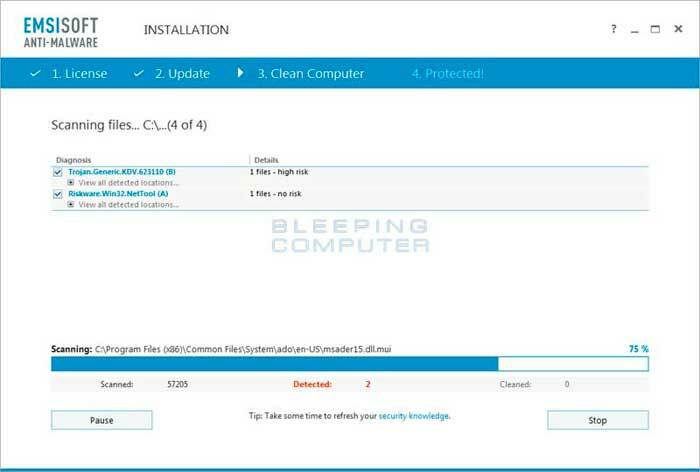 Once it is downloaded, double-click on the iExplore.exe icon in order to automatically attempt to stop any processes associated with Sysprotector Registry Cleaner Tech Support Scam and other malware. 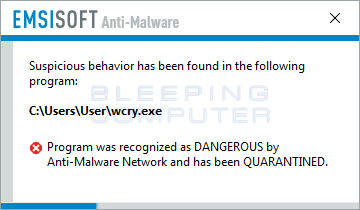 Please be patient while the program looks for various malware programs and ends them. When it has finished, the black window will automatically close and a log file will open. Please review the log file and then close so you can continue with the next step. If you have problems running RKill, you can download the other renamed versions of RKill from the rkill download page. All of the files are renamed copies of RKill, which you can try instead. Please note that the download page will open in a new browser window or tab. The download is fairly large, so please be patient while it downloads. Once the file has been downloaded, double-click on the EmsisoftAntiMalwareSetup_bc.exe icon to start the program. If Windows Smart Screen issues an alert, please allow it to run anyway. If the setup program displays an alert about safe mode, please click on the Yes button to continue. You should now see a dialog asking you to agree to a license agreement. Please access the agreement and click on the Install button to continue with the installation. 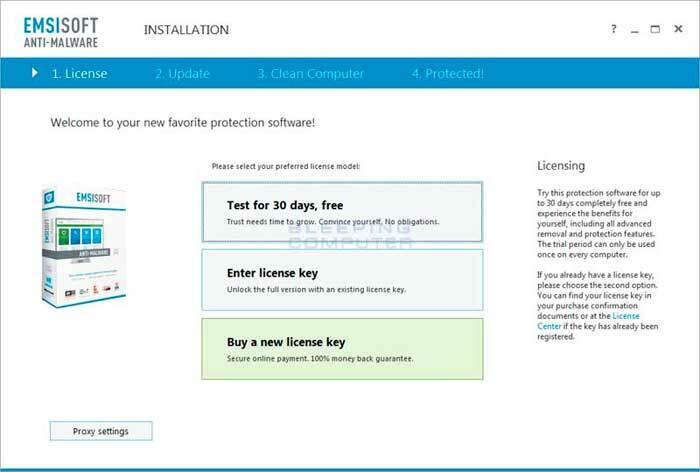 You will eventually get to a screen asking what type of license you wish to use with Emsisoft Anti-Malware. If you have an existing license key or want to buy a new license key, please select the appropriate option. Otherwise, select the Freeware or Test for 30 days, free option. If you receive an alert after clicking this button that your trial has expired, just click on the Yes button to enter freeware mode, which still allows the cleaning of infections. You will now be at a screen asking if you wish to join Emsisoft’s Anti-Malware network. Read the descriptions and select your choice to continue. 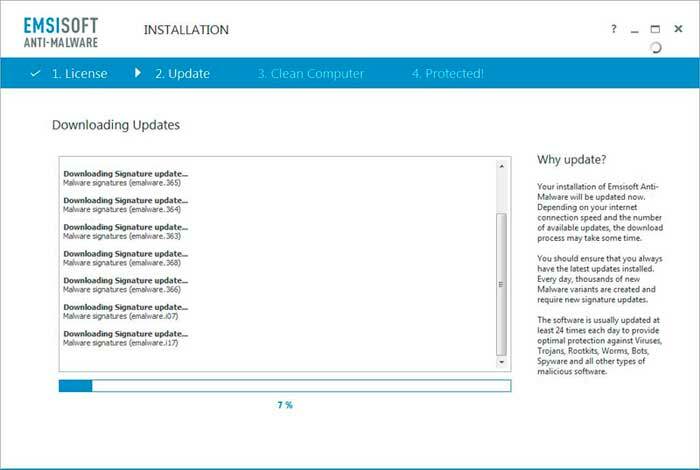 Emsisoft Anti-Malware will now begin to update it’s virus detections. Please be patient as it may take a few minutes for the updates to finish downloading. When the updates are completed, you will be at a screen asking if you wish to enable PUPs detection. We strongly suggest that you select Enable PUPs Detection to protect your computer from nuisance programs such as toolbars and adware. 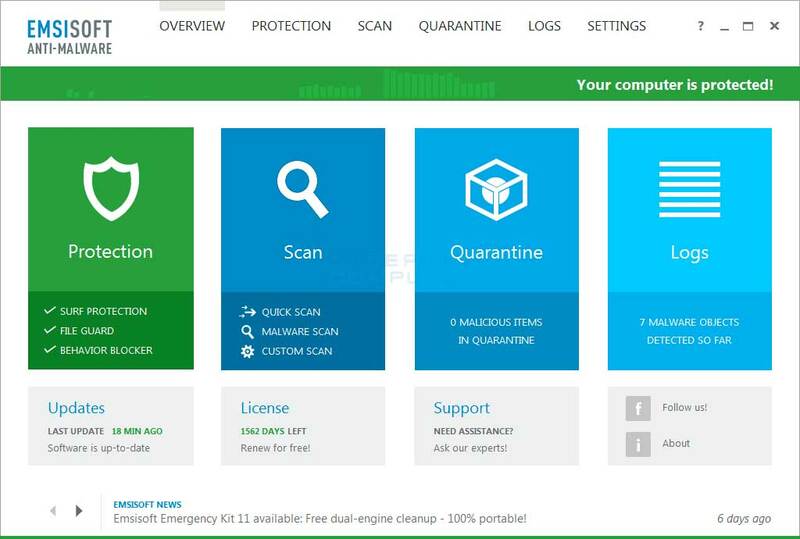 Emsisoft Anti-Malware will now start and display the start screen. At this screen, please left-click on the Scan section. 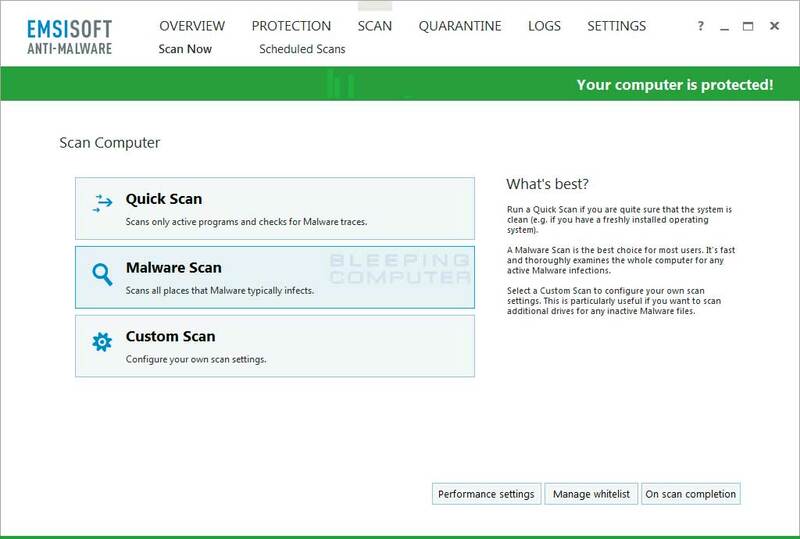 Please select the Malware Scan option to begin scanning your computer for infections. 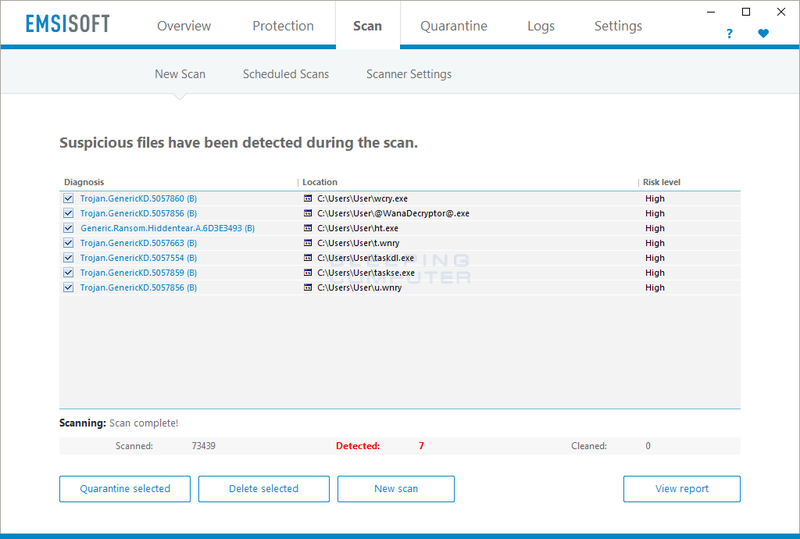 The Malware Scan option will take longer than the Quick Scan, but will also be the most thorough. As you are here to clean infections, it is worth the wait to make sure your computer is properly scanned. Emsisoft Anti-Malware will now start to scan your computer for rootkits and malware. Please note that the detected infections in the image below may be different than what this guide is for. When the scan has finished, the program will display the scan results that shows what infections where found. Please note, due to an updated version of Emsisoft Anti-Malware, the screenshot below may look different than the rest of the guide. Now click on the Quarantine Selected button, which will remove the infections and place them in the program’s quarantine. You will now be at the last screen of the Emsisoft Anti-Malware setup program, which you can close. If Emsisoft prompts you to reboot your computer to finish the clean up process, please allow it to do so. Otherwise you can close the program. Double-click on the icon on your desktop named mb3-setup-1878.1878-3.0.6.1469.exe. This will start the installation of MBAM onto your computer. When the installation begins, keep following the prompts in order to continue with the installation process. Do not make any changes to default settings and when the program has finished installing, make sure you leave Launch Malwarebytes Anti-Malware checked. Then click on the Finish button. If MalwareBytes prompts you to reboot, please do not do so. Now that you have enabled rootkit scanning, click on the Scan button to go to the scan screen. Make sure Threat Scan is selected and then click on the Start Scan button. 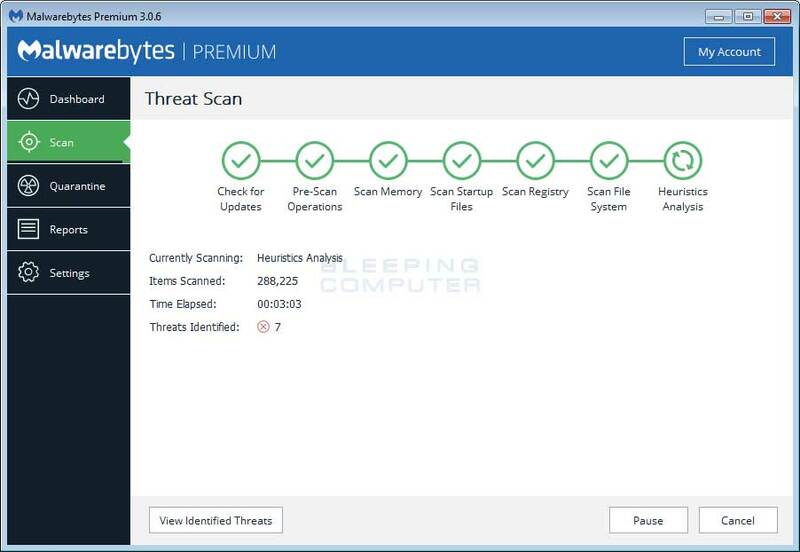 If there is an update available for Malwarebytes it will automatically download and install it before performing the scan. MBAM will now start scanning your computer for malware. This process can take quite a while, so we suggest you do something else and periodically check on the status of the scan to see when it is finished. Is it possible to recover WNCRY files that have been encrypted by WannaCry for Free? Unfortunately, there is no way to decrypt WNCRY files that were encrypted by the WannaCry Ransomware for free. There may, though, be methods to restore encrypted files that were stored on Dropbox or from Shadow Volume Copies that were not removed by the ransomware for some reason. If you had System Restore enabled on the computer, Windows creates shadow copy snapshots that contain copies of your files from that point of time when the system restore snapshot was created. These snapshots may allow you to restore a previous version of your files from before they had been encrypted. This method is not fool proof, though, as even though these files may not be encrypted they also may not be the latest version of the file. Please note that Shadow Volume Copies are only available with Windows XP Service Pack 2, Windows Vista, Windows 7, & Windows 8. Note: WanaCrypt0r will attempt to delete all shadow copies when the ransomware is installed. If by chance the ransomware was not able to remove the shadow volume copies, then there is a small chance you may be able to restore your files using this method. While the chanes are small, it is definitely worth trying. For a detailed explanation on how to restore files from Shadow Volume Copies, you can see this tutorial: How to recover files and folders using Shadow Volume Copies. 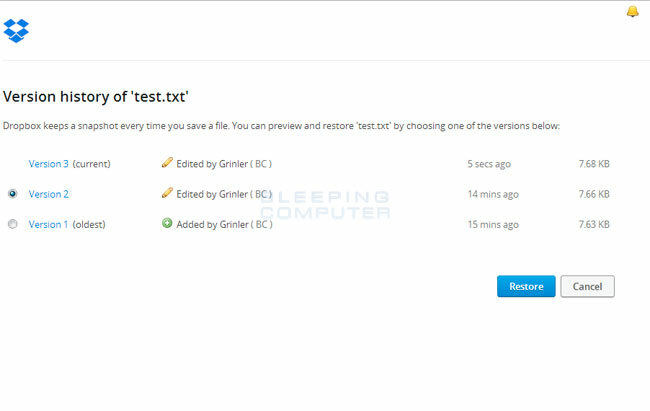 If you have DropBox mapped to a drive letter on an infected computer or synchronized to a folder, Wana Decryptor will attempt to encrypt the files on it. DropBox offers free versioning on all of its accounts that will allow you to restore encrypted files through their website. Unfortunately, the restoral process offered by DropBox only allows you to restore one file at a time rather than a whole folder. 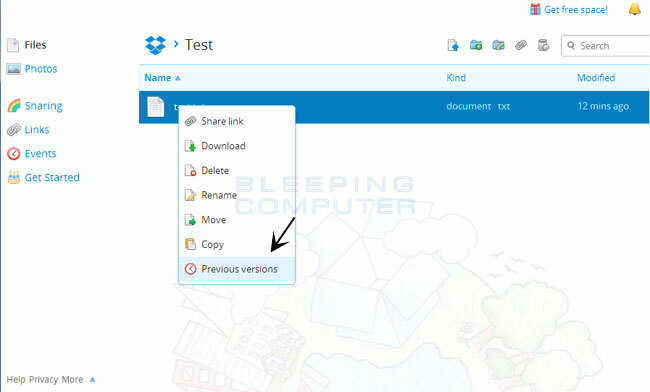 If you need instructions on restoring an entire folder in DropBox, please click here. To restore a file, simply login to the DropBox web site and navigate to the folder that contains the encrypted files you wish to restore. Once you are in the folder, right-click on the encrypted file and select Previous Versions as shown in the image below. When you click on Previous versions you will be presented with a screen that shows all versions of the encrypted file. Select the version of the file you wish to restore and click on the Restore button to restore that file. Unfortunately the process outlined above can be very time consuming if there are many folder to restore. In order to restore an entire folder of encrypted files, you can use the dropbox-restore python script located here. Please note that this script requires Python to be installed on the encrypted computer to execute the script. Instructions on how to use this script can be found in the README.md file for this project. How to Protect yourself from the WannaCry or Wana Decryptor Ransomware. The first thing you need to do is make sure you have all the Windows Updates installed. You need to especially install the updates discussed in MS17-010. If you are using Windows XP, Windows 8, or Windows Server 2003 then you can use this special update released by Microsfoft. There are a few methods and utilities that we recommend in order to protect your computer from ransomware infections. 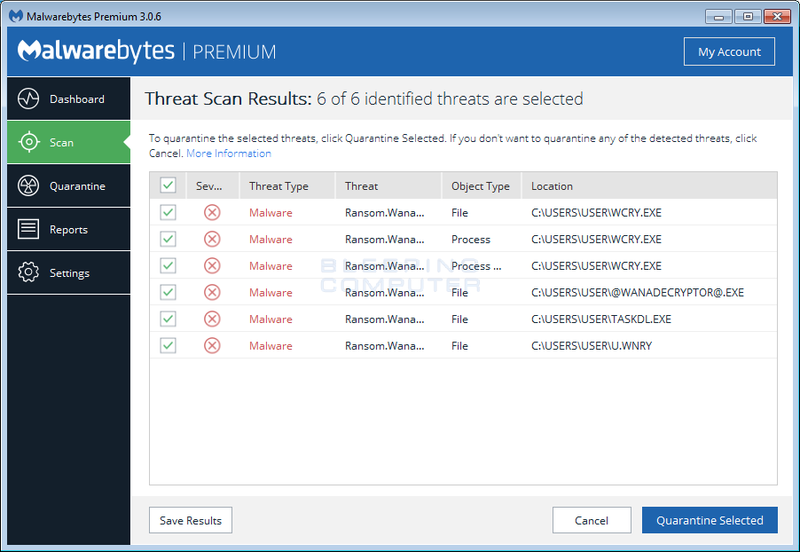 Three of the methods are Emsisoft Anti-Malware, HitmanPro: Alert, and Malwarebytes Anti-Malware. The fourth option is to utilize Software Restriction Policies that prevent programs from being allowed to execute from certain locations. In full disclosure, BleepingComputer.com makes a commission off of the sales of Emsisoft Anti-Malware, HitmanPro: Alert, and Malwarebytes. Emsisoft Anti-Malware, or EAM, has a feature called behavior blocker that has a proven track record of blocking ransomware before it can start encrypting data on your computer. Unlike traditional antivirus definitions, EAM’s behavior blocker examines the behavior of a process and if this behavior contains certain characteristics commonly found in malware it will prevent it from running. Using the detection method, behavior blocker detects when a process is scanning a computer for files and then attempting to encrypt them. If it discovers this behavior, it will automatically terminate the process. When I tested Emsisoft’s behavior blocker against WanaCrypt0r it was able to block it from encrypting my files. HitmanPro: Alert is a great program as well but is designed as a full featured anti-exploit program and is not targeted exclusively at ransomware infections. Alert provides protection from computer vulnerabilities and malware that attempts to steal your data. Unfortunately, because this program has a much broader focus it sometimes needs to be updated as new ransomware is released. As long as you stay on top of the updates, HitmanPro: Alert offers excellent protection. 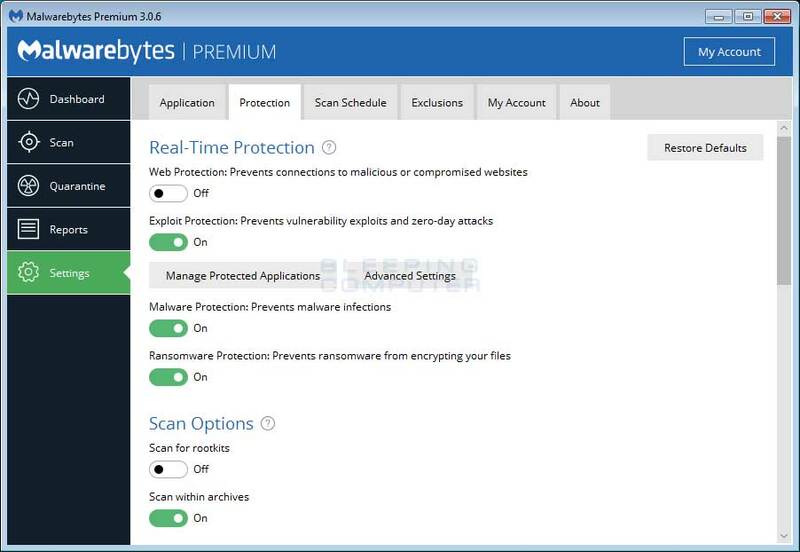 Malwarebytes is another program that does not rely on signatures or heuristics, but rather by detecting behavior that is consistent with what is seen in ransomware infections. 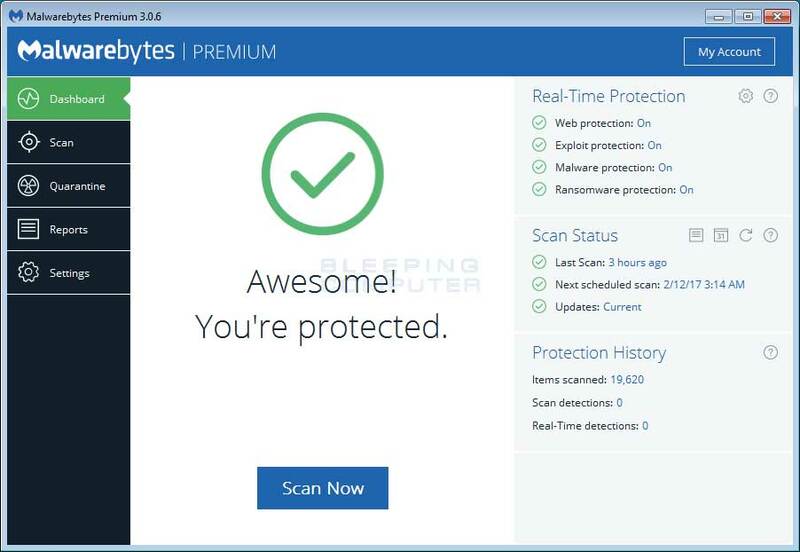 You can get more information information about Malwarebytes Anti-Malware here: https://buy.malwarebytes.com/us/. A very secure method of preventing a ransomware, or almost any other malware, infection is to use a method called Application Whitelisting. Application whitelisting is when you lock down Windows so that all executables are denied except for those that you specifically allow to run. Since you are only allowing programs you trust to run, if you are infected the malware executable would not be able to run and thus could not infect you. For those who are interested in learning more about application whitelisting, you can view this tutorial: How to create an Application Whitelist Policy in Windows. In order to block Locky, and other ransomware, you want to create Path Rules so that they are not allowed to execute. To create these Software Restriction Policies, you can either use the CryptoPrevent tool or add the policies manually using the Local Security Policy Editor or the Group Policy Editor. Both methods are described below. Note: If you are using Windows Home or Windows Home Premium, the Local Security Policy Editor will not be available to you. Instead we suggest you use the CryptoPrevent tool, which will automatically set these policies for you. 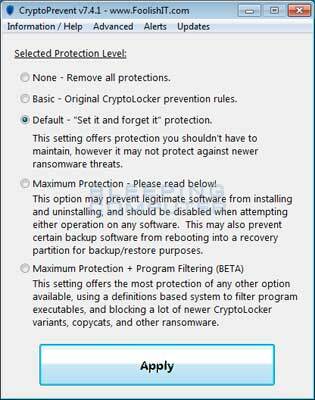 FoolishIT LLC was kind enough to create a free utility called CryptoPrevent that automatically adds the suggested Software Restriction Policy Path Rules listed above to your computer. This makes it very easy for anyone using Windows XP SP 2 and above to quickly add the Software Restriction Policies to your computer in order to prevent Locky, and other ransomware, from being executed in the first place. This tool is also able to set these policies in all versions of Windows, including the Home versions. A new feature of CryptoPrevent is the option to whitelist any existing programs in %AppData% or %LocalAppData%. This is a useful feature as it will make sure the restrictions that are put in place do not affect legitimate applications that are already installed on your computer. To use this feature make sure you check the option labeled Whitelist EXEs already located in %AppData% / %LocalAppData% before you press the Block button. Tip: You can use CryptoPrevent for free, but if you wish to purchase the premium version you can use the coupon codes for the following products to receive discounts. These codes are 20% off CryptoPrevent (Recurring) – bc20, 20% off CryptoPrevent (Single Year) – bc20s, and 10% off CryptoPrevent Bulk Edition – bc10. The premium version includes automatic and silent updating of application and definitions on a regular schedule, email alerts when an application blocked, and custom allow and block policies to fine-tune your protection. Once you run the program, simply click on the Apply Protection button to add the default Software Restriction Policies to your computer. If you wish to customize the settings, then please review the checkboxes and change them as necessary. If CryptoPrevent causes issues running legitimate applications, then please see this section on how to enable specific applications. You can also remove the Software Restriction Policies that were added by clicking on the Undo button. (TeslaCrypt) version 3 and 4, Chimera, Crysis (versions 2 and 3). Latest updates: decrypts Dharma ransomware.